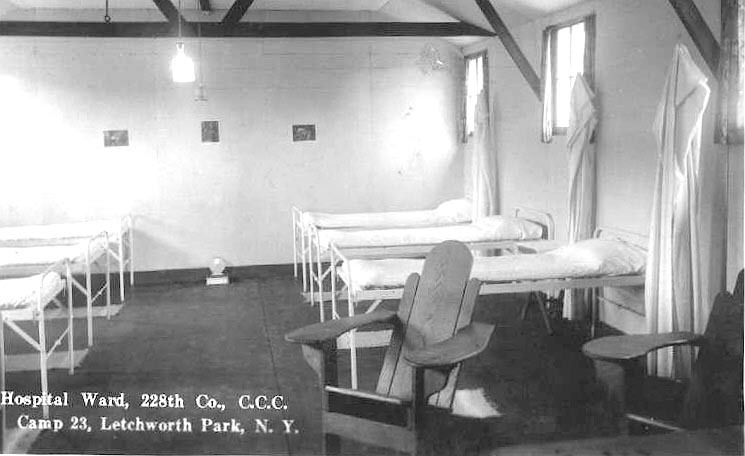 "Hospital Ward, 228th Co, CCC, Camp 23, Letchworth Park, N.Y."
CCC camps were complete communities - including kitchens, mess hall, barracks, recreation center and, of course, a hospital. This real photo postcard of the Big Bend Camp shows that interior of the Camp's hospital ward. For more information on the CCC camps, see our Glimpse of the Civilian Conservation Corp. Image provided to letchworthparkhistory.com by Jane Schryver - thanks for sharing, Jane!